the painted woman - olympic colors for summer 1932: New Patterns! - Which One to Sew First? New Patterns! - Which One to Sew First? Hello everyone! 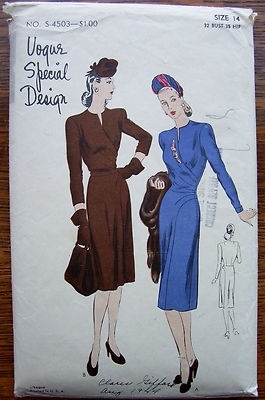 I have some new vintage sewing patterns to add to my stash. I'm so excited about these but I can't decide which one to make up first. Advance 4199 - I can see made out of a fun colored print. Vogue pattern 5403- Yeah, finally a pattern with a side drape! I've been looking for one of these for a while now. Cori and I are thinking about having a set of engagement photos done with us in 1940s fashions so I will most likely use which ever dress I make for the photo shoot as well. There is a family friend with a collection of classic cars. We're hoping we can twist his arm into letting us for one for the photos. Fingers crossed! 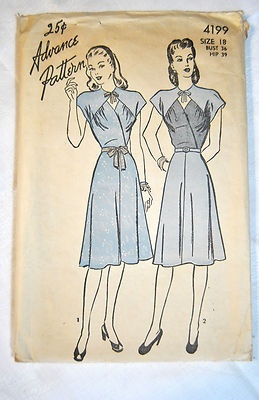 Vogue Special Design pattern 4503- Great waist detail on this pattern. I can see this made in a solid color with some kind of trim or maybe a large rhinestone pin on the bodice. 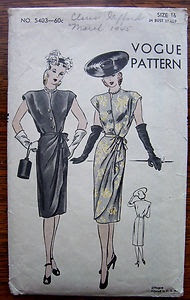 Hollywood pattern 1413- I have a black fabric with a little red and green floral print that would work great for the dress Hollywood pattern. I really like the detail on the bodice as well as the side drape. This is my blog post from May 6, 2013. Why is it being republished here without my permission? Please remove my blog post. I'm happy to see that you follow my blog but in the future please do not re-post anything again from my blog without asking first. Thank you. The content of this post belongs to me and has been copied and re-posted without my permission. Please remove this post from your blog. This is the second time I have asked. If my material is not removed in the next few days I will have no choice but to report your blog for copyright violations.